My first poinsettia this season is a ruffled one. I don't see these very often. Beautiful shot, tis the season for these. 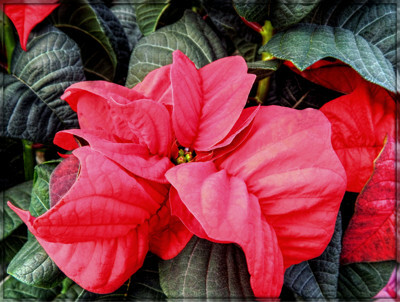 Very nice Kathy - I don't believe I have seen this type of poinsettia, until now - I really like the ruffled formation of the leaves/bracts - Great Capture!!!!!!!! I have not seen this one before, lovely! Perfectly captured with the camera. Kathy, like some of our friends above, I've never seen this ruffled species before. Very special. Perfectly handling of the for phototopography red color as well! Would make a good greeting card Kathy.